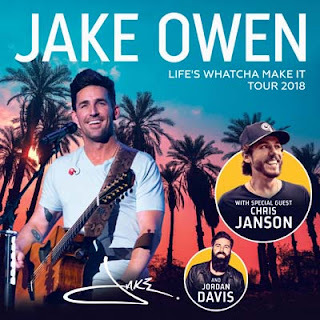 Jake Owen Life's Watcha Make It Tour with Chris Janson and Jordan Davis Presale Code! Jake Owen is back on the road in 2018 and he is bringing Chris Janson and Jordan Davis along with him for the Life's Whatcha Make it Tour! Presale tickets are available now for seats and VIP packages! The highest level VIP package includes a meet and greet with Jake! Use code: SUNSHINE for tickets! Tickets and tour date available here! Click here for VIP Packages!